19 year old McGale student Merrelyn Vanderschmittle woke up to an unpleasant surprise Sunday morning when she discovered a balloon full of cocaine on her front balcony. “I had no idea what to do with it,” says Merrelyn. “I was worried that if I called the cops, I’d get arrested. I was going to flush it down the toilet, but even that made me nervous." Eventually, though, Merrelyn settled on calling the police with her discovery. 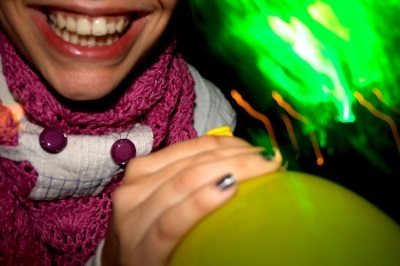 It turns out, she wasn’t the first person to call the police about balloons full of drugs. “Apparently, dozens of people across the city had also reported drug balloons to the police,” says Merrilyn. “Montreal sure is weird." Sgt. Peralta of the Montreal Police agrees. “This city certainly is bizarre,” says Sgt. Peralta. “Someone, for some reason, unleashed hundreds of thousands of dollars worth of drugs into helium balloons at some point last week. They finally started falling back to earth all across the city. We’re not sure how many balloons were launched. We don’t even know why they were launched or who would benefit from such an outlandish and expensive project." No one knows who sent out the helium drug balloons, but people across the city have been out hunting for them en masse. “I found a balloon with a thousand dollars worth of LSD in it,” says 23 year old drug enthusiast Keith Beaubien. “I’m never going to have to buy LSD again. I’ve got enough to last me a life time. It’s fantastic. I don’t know who the mystery drug balloon man is, but I’d like to thank him from the bottom of my drugged out little heart." The police for their part are warning Montrealers not to keep the balloons they find. “Just because you found the drugs, doesn’t mean you get to keep them,” says Sgt. Peralta. “Drugs are still illegal. They’re bad, mm’kay. We’re asking everyone who comes across one of these balloons to immediately contact us. We’ll make sure to safely dispose of the illegal narcotic."